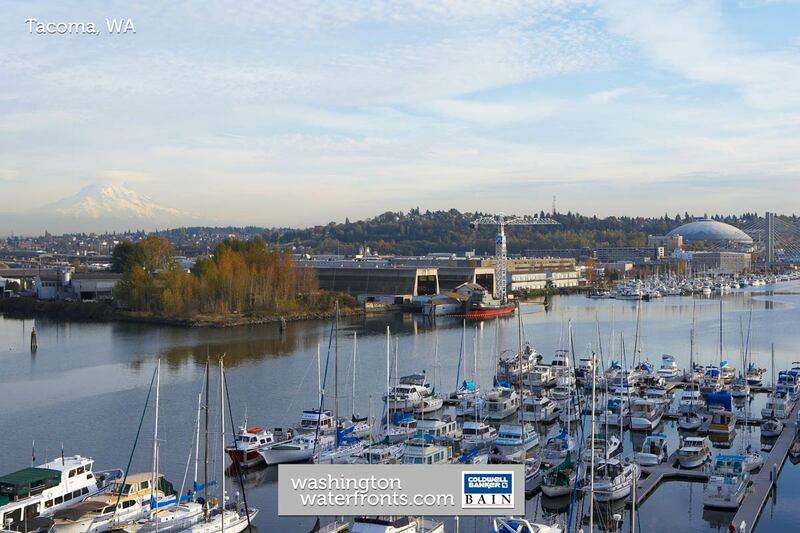 Tacoma, Washington’s third largest city, lies on the Puget Sound between the state capital, Olympia and Seattle. It’s been named among the most livable cities in the U.S. with lots to offer residents thanks to its position on the water with the peaks of the Cascade Mountains, including Mount Rainier, nearby. As it has a working waterfront, there are actually a limited amount of Tacoma waterfront properties, though what it does have is rather affordable, especially as compared to the city of Seattle. Owning Tacoma waterfront real estate is possible in several areas, including Salmon Beach, one of the city’s most secluded neighborhoods with homes on stilts at water level located just south of Pont Defiance Park on the western shoreline. Waterfront homes at Titlow Beach near the Tacoma Narrows Bridge enjoy picturesque water and bridge views as well as access to a community center, beach, park and water play area, while Point Ruston is a unique neighborhood offering South Puget Sound, Olympic Mountain and Mount Rainier views that mixes waterfront living with great shopping, dining and entertainment opportunities. Downtown and the Thea Foss waterway, a north-south inlet of Commencement Bay separating downtown Tacoma from the Port of Tacoma, is known for its more budget-friendly waterfront condominiums. Tacoma waterfront real estate owners not only enjoy easy access to a host of activities on the water and on the beach, but a wealth of cultural attractions, including museums and theaters and other performance venues like the Tacoma Dome, along with a host of dining and shopping opportunities. You don’t have to stay indoors in the winter either, as seasoned Tacoma skiers make frequent visits to nearby Crystal Mountain. When it comes to Tacoma waterfront property, here, you can get big city living for less, complete with an impressive built-in backdrop of the Puget Sound and Mount Rainier. Take advantage of our industry-leading tools to make your property search as easy as possible and be sure to register for a FREE account so that you can receive email alerts whenever new Tacoma waterfront real estate for sale hits the market. If you're seeking to sell your Tacoma waterfront property, contact our Waterfront Specialists directly for a comprehensive listing analysis and to learn more about the cutting-edge marketing strategies we'll use to sell your home quickly for top dollar!